good morning. | we break fast. My family was never really that big on formal, sit-down dinners. My parents have this island in their kitchen: Four diner stools (one for each family member) opposite the stove. We have eaten meals at that counter since my brother and I were still in grade school. When company joins us, we just grab a stray chair or stool from somewhere else in the house and improvise. The older we got, the less likely it was that we’d even all sit at this counter at the same time. For all of my non-traditional tendencies, I have this attachment to family meals and breakfast is… well, breakfast is the best meal of all. My mum and I once traveled to Madrid together. I found cheap airfare and she wanted to keep my company. We ended up staying in the Westin Palace, and somehow, we managed to get their utterly ridiculous breakfast buffet included in our booking. It was made-to-order omelettes and fresh fruit and yogurt and churros with chocolate sauce. Coffee. Such fantastic coffee. We slept in a room with two beds right next to each other. I could eat breakfast for every meal, every day and probably never tire of it. Eggs are the reason why I could never go vegan. I love them so. But eggs are just a single breakfast ingredient of, like, a million. Almost more than breakfast food itself, I love sharing breakfast with friends. There’s something so honest about waking up together. Not waking up together, but seeing their faces first thing in the morning, pre-coffee. Pre-makeup. Post surf. Post run. In talking over pancakes and eggs benedict, we form real, human connections. Sharing breakfast feels important, like camaraderie. Like we all chose to align our schedules, get out of bed at an ungodly hour and convene to partake. To break fast. 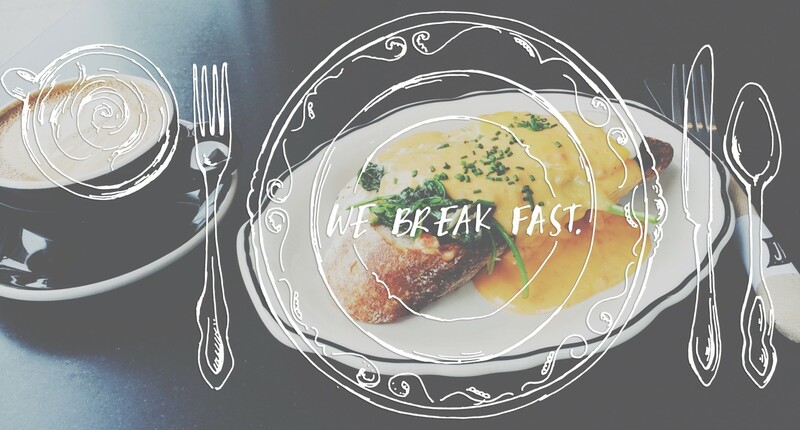 we break fast is a celebration of that.